You want to introduce a new cuisine to a city? What do you do? Open up a fancy place, blow on the interiors, huge marketing campaign and then shut shop after a few months if it fails!?! Wrong! The approach of the owners to introducing Ethiopian cuisine to Chennai has been marvellous. Small place. Experiment. See if the crowd likes it. Already having a few restaurants helps, especially if they are all in the same place. 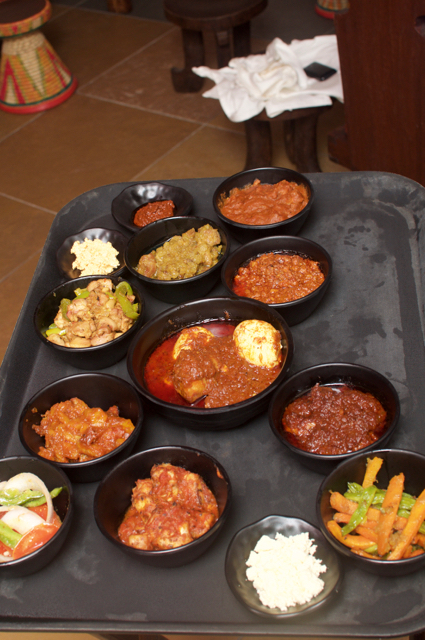 Along with Batlivala and Khanaboy and Meena Tai, the complex now welcomes Chennai palates to try out Ethiopian! And what better way than a small 10 seater place to introduce it. The interiors are symbolic with what I guess is a replica of Ethiopian interiors. The tables and the stools are set for a community eating which we found out later is the way of life there! Your group eats from one plate! Actually, it may not be so difficult to try it out because the flavours are so so similar to Indian. My only twist with Ethiopian was at a buffet in Vegas, so I don't remember those flavours at all, so this post is from the POV of a novice in that cuisine! The Injera is something I remember vividly, though the name and the flavours were a refresher course for me. The dosa type thing, rather a large ragi dosa on which the curries are placed is aptly positioned for community eating! My friend was invited to the restaurant and he tagged me along, so we were served their biggest meal, the community mezze platter (think it is called the mezzoz here). Priced at Rs. 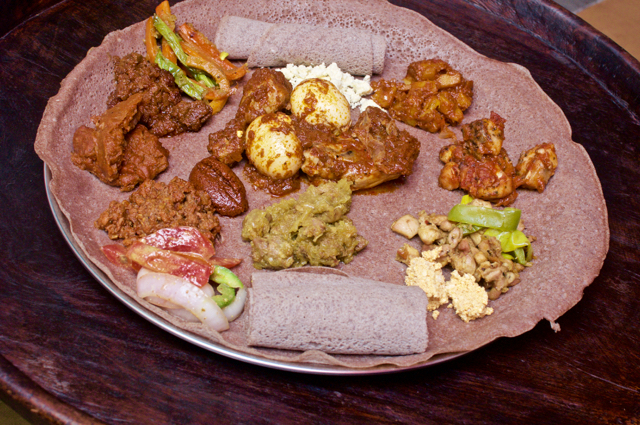 4199, it comes with a soup, this big bad @ss set of meals, unlimited injera, dessert and coffee for four people. Going by the sizes, I think it could feed three couples! It is almost like ordering a full meals! Sit back and eat! 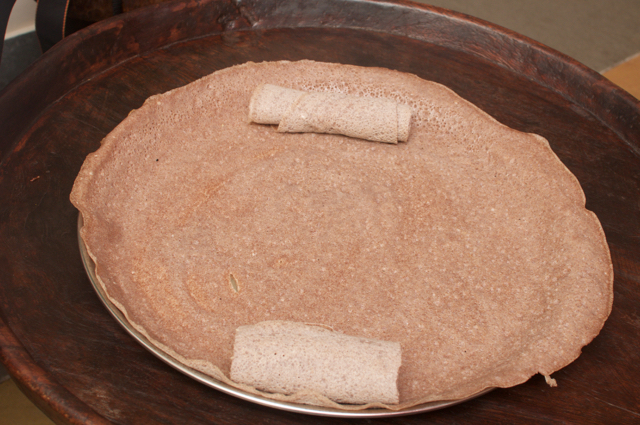 The injera (the ragi dosa) in unlimited! While the original injera is supposed to be made with a iron rich teff flour, here is it a mix of ragi and teff, till they find ways to import teff is large quantities. Yes, starting with a 10 seater is a wise idea indeed! So the injera is on a plate, like our banana leaf and all the gravies are placed on top, but the only difference is that the injera is also edible. I don't think we eat our banana leaf! And it is like all of us eating from one banana leaf! OK, you got to experience this! So among the ones that were served, a lamb cooked with channa was fantastic and the minced beef was excellent. Everything else was pretty good and had an uncanny resemblance to our food. I obviously don't know if it has been extensively Indianised or if the Ethiopian flavours are so close to Indian flavours, but there was no palate shock for me! OK, I take that back. There was a palate shock. 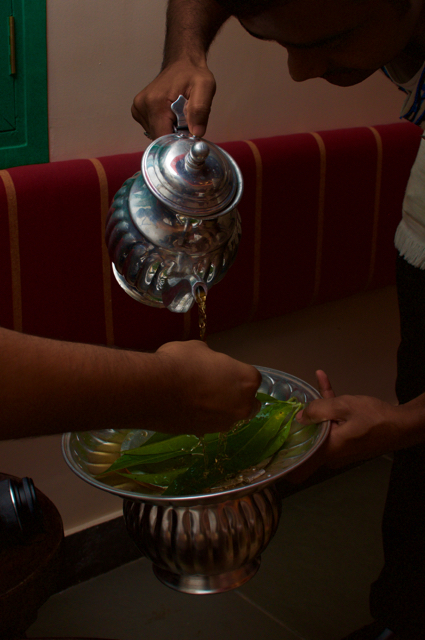 Right at the end when they served Ethiopian coffee with butter, salt and sugar! Definitely a palate shock. Forget palate, it was a brain shocker! Coffee with butter? And salt? And Popcorn!?! The butter was smelling heavenly and was dark, so clearly this wasn't Amul butter. 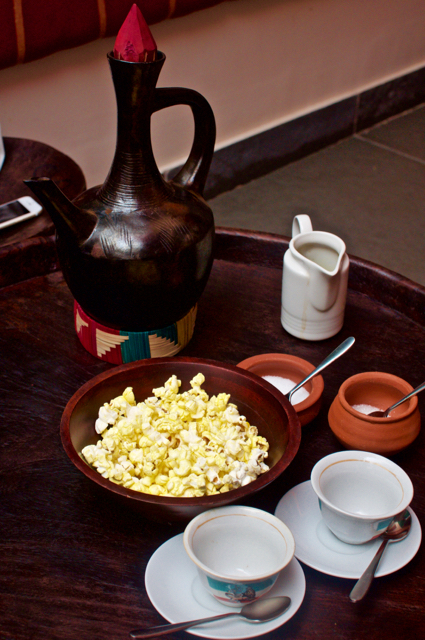 Apparently in Ethiopia, they first drink coffee with butter, then with salt and then with sugar! The espresso was indeed enjoyable with the butter, but after a few sips when the brain registers it! 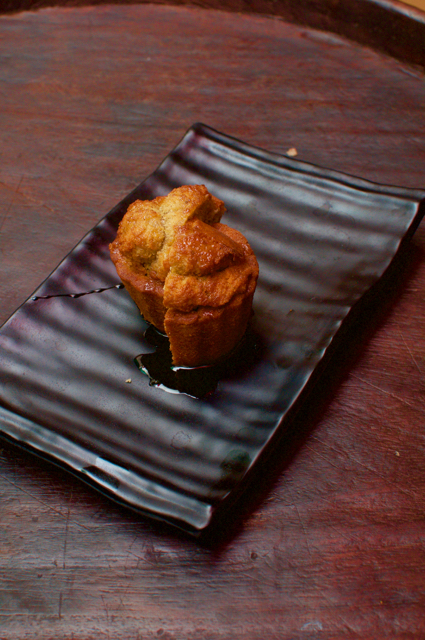 Oh, there was dessert before this and it was this cake made of teff flour! Tasted like a ragi cake with chocolate inside, but went well with the theme of the meal! Abyssinian is on the first floor of the complex that hosts Meena Tai and BK, just off Kasthuri Rangan Road, a few minutes down the road from Tangerine.